Gemini 2016 financial predictions forecast the income and expense trends for this zodiac sign in the coming year. Find out if you will make money or spend more this year. While 2016 may not be make the Gemini sun sign rich, you will have a consistent cash flow. 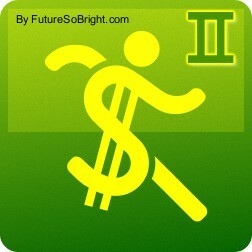 Put your best foot forward to have a good steady cash flow during this time. You are going to be a purchaser this year, forecasts the 2016 money horoscope. You will find money coming in from sources you didn’t even know you had and this will allow you to clear most of your debts this year. Your artistic abilities will help keep your cash flow steady and there is luck for you in this area. At the end of the year you may receive a chunk of cash possibly from a real estate investment.